It's the season for open houses, soirées, and gift exchanges. This year, three great savoury gift-treats, posted in time for you to try them out before giving, if you are inclined, and one flashy party favour. Vegan/vegetarian/gluten free, this snack has something for everyone and is inexpensive. 1. Preroast the chickpeas, it makes the mix stay crunchier. Heat oven to 400 degrees. Spread chickpeas evenly on a sheet pan and roast until crisp and golden in spots, shaking pan occasionally, about 20-25 min. 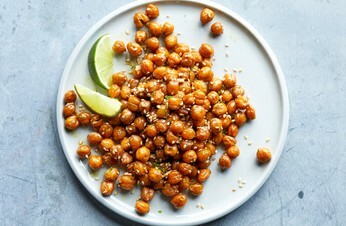 Turn off oven and leave chickpeas in it for another 10-15 min., watching so they don't burn. Remove and cool 15 min. 2. Add 1/12 teaspoons toasted sesame seeds along with the cumin, and also add the lime zest mentioned in the recipe, it adds a little kick in the Santa pants. Make day of or day before for max crunch. Pack into a mason jar or canister—and make a double batch if there are young adults around. This recipe is a favourite of mine and reader lagatta's. I have yet to see anyone not make that "mmmm!" sound over these decadent little savoury nuggets, which are perfect hors d'oeuvres. They store well in a freezer for several weeks, but if you give them fresh, the angels will sing. Pack as you would a butter cookie (which let's face it, they are) in a tin, so they don't break. They can spread it on burgers or serve with other meats, spoon on bruschetta or a cracker, or eat out of the jar when no one is looking. It makes 1 1/2 cups but very easily doubles (or more). They do not have to look perfect and formal, so kids and grandkids can help out if you'd like. Start to gather the materials reasonably early because you need an empty toilet paper roll for each guest. Gather your scraps of wrapping paper, magazines, feathers, glitter, stickers...and your crackers will look wildly festive. I use way more ribbon than the photos and curl it. Fringe the ends with scissors. 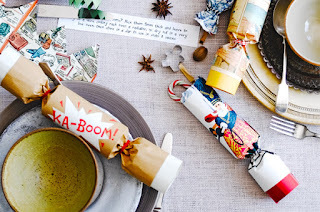 Play; make each cracker look entirely different from the others! The goodies inside can be personalized to the recipient, which is part of their charm. The adult ones might contain grown-up treats (perfume samples and brandy nips are great). Throw in some individually-wrapped chocolates (like Hershey's kisses) or hard candies, too. Write the recipient's name on the cracker; lay them across each plate as place cards. Jamie Oliver's directions are easy to follow, and the snaps are optional. Would you like to share any of your favourites? If the recipe is posted online, comment with the link. If it belongs only to you, we'll come over. Is it really that time already? :-) Thanks for sharing. 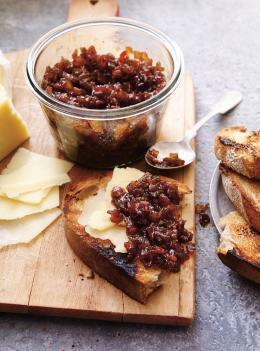 Describe the "bacon" you use in the onion bacon jam. Can I use the round slices that look like ham that we call "Canadian bacon" in the U.S.? Oh Abigail, no, "Canadian bacon" wouldn't work. Sometimes you just have to go for the real thing! Abagail: Made with sliced bacon; average to slightly thick works best. The recipe specified "sliced bacon", not "Canadian bacon", (or as we call it here, "back bacon" or "peameal bacon")which is an entirely different cut of pork, much leaner. You want that unctuous. smoky taste. I second Jean Shaw. LauraH: Not to be indelicate.. but if making those party crackers you need to put in some work ahead of time so you have enough rolls— so I wanted to give anyone interested enough time, especially if making 8 or 10 of them. Thank you for those recipe links...i will be making a couple of them for sure! That bacon jam sounds divine! I am envisioning it with brie cheese....a great party staple. 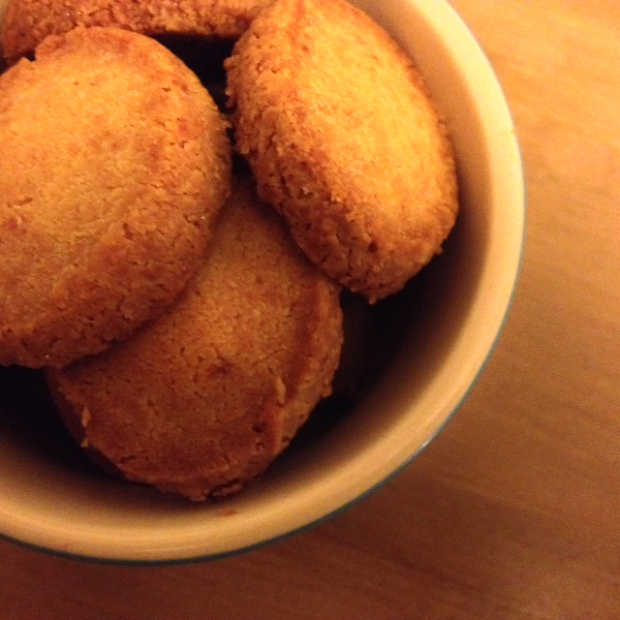 I havent made my Nigella biscuits in quite a while so will have to do them now! They are butter cookies, but savoury, and as some wit described mature cheese, "the drunkard's biscuit". Yep, fine with wine, cider or beer. Though I have just washed my anti-Nigella wide headband woven out of cotton in many colours (like a kind of snood) as I advise against her practice of cooking with all her thick shiny hair loose; there is nothing pleasant about biting into a parmesan biscuit and retrieving a long hair. I've never been quite happy with my roasted chickpeas; welcome advice. I am making poultry stock now, from bones and some fresh turkey necks I found at PA nature. Mason jars of that - very concentrated stock - are always very welcome gifts, except for vegetarians obviously, who get miso and seaweed broths. Bacon jam is on the top of my list, followed by firecrackers. I will invite 6 of my dearest girlfriends over for a wine and toilet paper party. I don’t remember if I’ve shared this recipe. Kumquats may not be in stores until late in the year, but these are easy to make and are delicious over simple cakes, in cocktails and plopped into sparkling water. It does seem early, but the holidays will be upon us very soon. Thank you for the ideas! lagatta: What a great idea-stock! I've never had a hair in a biscuit but I once found an industrial staple in a plate of pad Thai. Leslie Milligan: An unusual gift for a host no matter when they hit the stores. It is not feeling so early for us to think about holiday festivities here in Canada as we have already had our Thanksgiving, and the specialties are already on the shelves. Duchesse, La Boucherie du marché has poultry carcasses (chicken always, sometimes turkey, duck, guinea hen etc) in a freezer compartment near the cash. The Moroccan butcher Al Khair sometimes has fresh carcasses for a good price, and they are grain-fed local poultry as well. I'll advise anyone to add a bit of gentle acid - lemon juice (the packaged stuff is fine for this), or a bit of wine or cider vinegar. Not enough to make it sour; the point is to leach the calcium out of the bones to get a good jellied stock via slow cooking.